Aren’t these pretty? 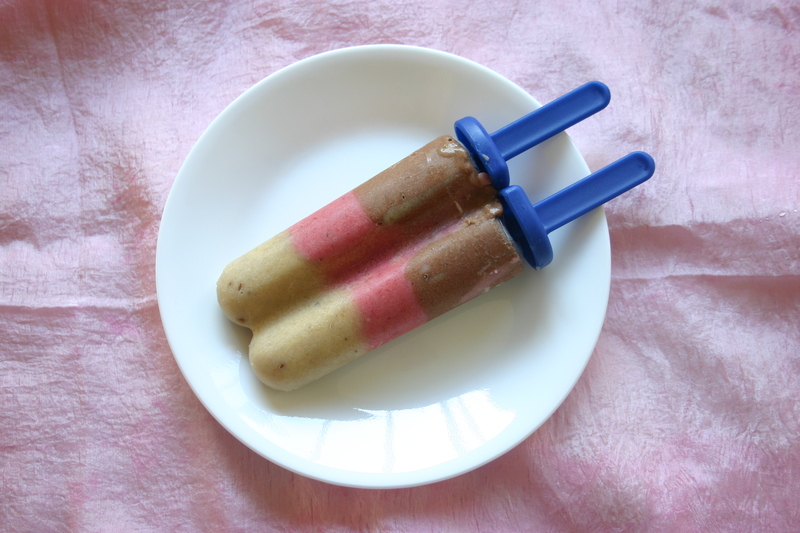 Banana ice-cream isn’t new but it sure is yummy and easy. 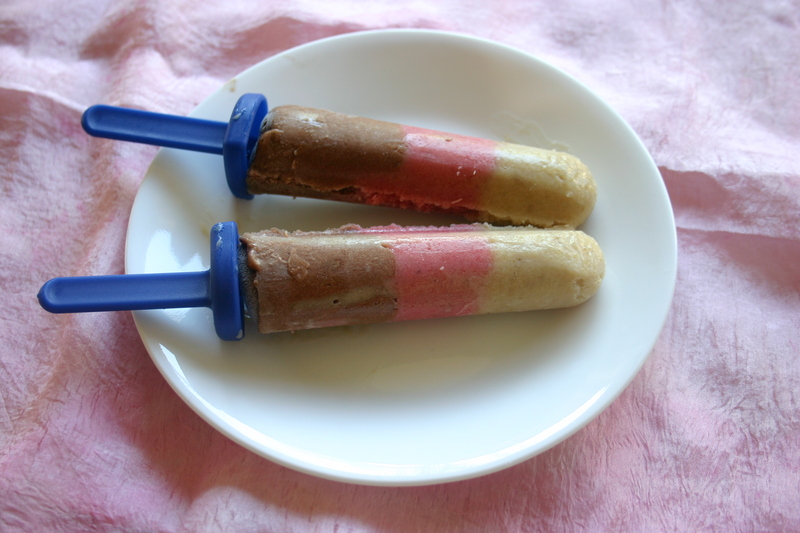 We’ve made these ones with three different flavours: vanilla, strawberry and chocolate. They take me right back to my childhood – those idyllic days before dairy-free, sugar-free and additive-free became my norm, and the delight in scooping ice-cream out of a tub that has three different choices of flavours all at once – although I would always go for vanilla. Still do. I love chocolate but chocolate ice cream has always made me feel like I am eating cold mud (I think I must be quite alone in the world with that particular visualisation!) and strawberry ice-cream was sweet and lovely until that artificial strawberry flavouring kicked in and the coughing would start. I can’t believe I didn’t discover banana ice cream until adulthood! Blend up the peeled bananas with the vanilla, maple syrup and coconut milk. Whizz it all together until it is lovely as smooth. This is the base mixture for the ice-creams. 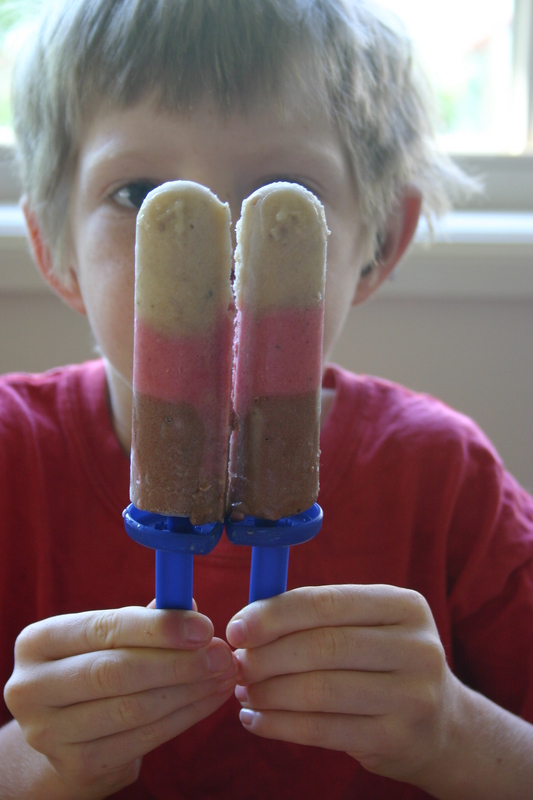 No need to remove it from the blender, just spoon it out and into the moulds as you go. Spoon 2 teaspoons of this mixture into the bottom of your ice cream moulds. Add the washed and hulled strawberries to the base mixture left in your blender and blend again until it is all smooth and pink. Add more strawberries if you like it pinker. Spoon 2 teaspoons of the strawberry mixture on top of the base mixture in the ice-cream moulds. Add the cacao to the pink mixture left in the blender now. Depending on how much of the mixture you’ve used already, you may need to add another banana or some more coconut milk to make it go a bit further. Blend until smooth. The cacao will turn the mixture quite brown and chocolately. Smells delicious even now! Excellent! I’ve had to make so many batches of these. Choc-banana and mango are great combinations too.